German Chancellor Angela Merkel is hoping cross-party discussions over Brexit in London will end a stalemate over the UK's exit from the European Union. British Prime Minister Theresa May has held discussions with the opposition Labour Party to try and find support for a Brexit withdrawal deal that has already been rejected by the House of Commons three times. “We hope that intensive discussions in London can lead, even by next Wednesday when we will have our extraordinary summit, to a position that British Prime Minister Theresa May can present to us, that we can then discuss,” said Merkel, according to the Reuters news agency. Merkel met with Irish Prime Minister Leo Varadkar in Dublin and said that the UK's position had changed significantly over recent days. Varadkar urged patience with the British government, warning that the UK should not leave without a Brexit deal. “Matters continue to play out in London and I think we need to be patient and understanding of the predicament they're in,” said the Taoiseach, reiterating the European position that any further delay to Brexit must be with good reason. The German and Irish leaders also talked about the Republic of Ireland's 500 kilometre border with Northern Ireland and how to keep it open even in the case of a no-deal Brexit. The potential for a hard border between the UK and its only land frontier with the EU has been a major stumbling block in Brexit negotiations. “Where there is a will there is a way,” Merkel said, as reported by Reuters, referring to efforts to avoid a hard border while at the same time protecting the EU's single market. An open border between the two countries is a major part of the peace agreement that led to the end of The Troubles. It is feared that a closed border and physical customs controls could reignite sectarian tensions. 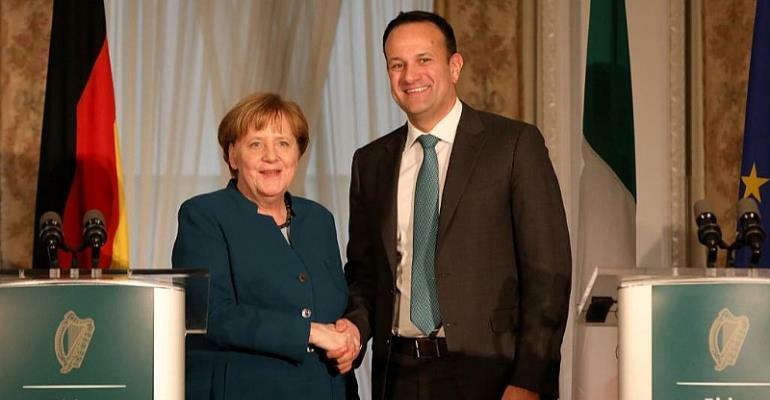 Varadkar had arranged for residents living along the border to go to Dublin and meet with Merkel during her trip to emphasise the impact of any hard border and how peace-building efforts between communities could be affected.